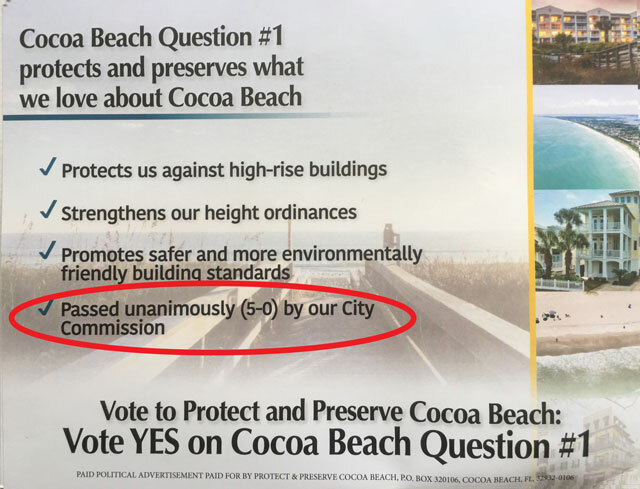 Cocoa Beach: If Question One Is So Great, Why Lie About It? Years ago, Byron offered that people who would normally register as Democrats should instead register as Republicans so in primaries, they could vote for the lesser of Republican candidates to run against a Democrat foe in the general election. In the general election, the faux “Republicans” would then shift their vote for the Democrat candidate hoping to get them elected. In other words, Byron was advocated lying in order to skew primaries and subvert the election process. In the op-ed piece, Byron is up to his old tricks of not being truthful. Why? Because it retains the 45-foot height that’s been the law since 2002. If the ballot initiative was to retain the current height limits, there would be no need for the ballot question – the current law would just be kept on the books without a change. Why is Byron not telling the truth about the height issue as it relates to the ballot issue? Question one has limited purpose. It affects only the 13 percent of the city where buildings as tall as 45 feet can be built. It has no impact on city areas set aside for single-family homes. Sec. 6.04. – Building height limit. The Charter height requirement applies to every structure in the City. If you don’t believe us, then ask yourself why the City had to pass and exemption for the Fire Department facility? We don’t understand the pattern of lies and misrepresentations Byron is going with here. Why not just be honest about it? Secondly, it brings up to date the point from which habitable height is measured, conforming to standards set by the Federal Emergency Management Agency. The Federal Emergency Management Agency does not set the heights of buildings or the measuring points from which building heights are measured. As Byron notes, what they do say is that buildings in certain flood areas should have their “habitable area” above flood plain levels. (If a building does not, it is very difficult to get insurance on the building which is an issue within the market, and not a mandate of height from the government.) In the case of Cocoa Beach, the ballot issue is to change the City Code that “the 45-foot height that’s been the law since 2002” to allow a greater overall height of the building by making the first first floor be above the flood plane level. By Byron’s own admission, if passed, the ballot measure would allow a building to be 45′ tall PLUS the height to get it above the flood plain. The extra height, by the way, would allow for extra on site parking under the building which means that more buildings could be built as the need for parking alongside the building (ie a parking lot) has been decreased. Smaller lots, or more units on a lot and more height. First, the ballot question allows up to 10 feet of unoccupiable space above the living area.This puts the noise and heat of air conditioning equipment and other gear out of sight on the roof. And it encourages a building appearance more pleasing than the ugly flat-roofed-box current law all but mandates. This means that even without the height added for the flood plain, builders will be allowed to add an additional 10 feet on top of the 45 foot limit. Only in some weird, warped world could a building that could be at least 55 feet tall be considered the same as a 45 foot tall building. Yet that is what Byron is trying to sell. It is clear that Byron’s contention that the ballot measure “retains the 45-foot height that’s been the law since 2002” is a complete lie and fabrication designed to deceive the voter. All five city commissioners voted in favor of this ballot question. That’s a whopper of a lie. The Commissioners voted unanimously to put the question on the ballot, but they have not (and could not) vote in favor of this ballot question. Voting for this ballot question as part of the general election in November has not even opened yet. It is impossible for the commissioners to have voted for the measure. Not only did all five Commissioners not vote for to pass the ballot issue, none of them did. Whether you believe that this change in the City Code and Charter would be good for the City of Cocoa Beach is certainly something that you should decide on your own. Frankly, we can see merits to the changing of the standard as well as merits to keeping it the same as it is now. However, if this is such a great idea and something that would benefit the City, why lie about it? Why are Byron, the PAC and others lying about the facts of the matter? Why are people lying about the practical effects of this measure when it comes to the height issue itself? You’ll have to decide for yourself if you think you should support a measure that proponents feel the need to lie to get it passed. For us, if they have to lie and don’t trust the people of Cocoa Beach with the truth, can the liars be trusted with anything? You left out the name of the PAC. “Protect and Preserve Cocoa Beach”. Seems the name of the PAC is deceptive (most PAC’s are) and yet another attempt at fooling the voter. While we agree with your statement on the deception of the PAC’s name, we have are looking at other issues with that PAC and how the City may be letting them skirt on electioneer documents. We didn’t want to bring that up as the post was getting long to begin with and we were hot under the collar by the lies already. We know you know what that is like. Vote NO on Cocoa Beach Question One. Mr. Byron is just parroting information put out by the City itself in their “educational flyer” so let’s look at that too. 1. Incorporate FEMA Flood elevations – these flood elevations are already mandated by the state so Question One doesn’t do anything except let developers build taller and taller as/if the flood elevations increase. One thing Question One does change is it allows developers to apply the flood elevation requirements to their entire parcel even if only a tiny portion is actually in a flood plain – a boon for the developers. The requirement to build above flood elevations already exists and comes from the state. 2. Permit reduced site coverage for natural storm water filtration and improved water quality. The current charter requirements already permit for this, these are decisions made by the developer in the design phase of a project. Question One does nothing to improve water filtration or water quality. 3. Permit screening of rooftop equipment to preserve the residential character of buildings. The current charter requirements already permit for this, these are decisions made by the developer in the design phase of a project. Question One does nothing to improve the residential character of the city. 4. Allows new construction that is safer, healthier, and more user friendly. The current charter requirements already permit for this, these are decisions made by the developer in the design phase of a project. Question One does nothing to improve the safety, health, and user friendliness of new buildings. While none of the statements put out by the City are outright lies, they are misleading and attempt to sway voters to vote for Question One. To all you existing condominium folks who are residents of Cocoa Beach, the current Charter Requirements already allow your existing structures to be razed/rebuilt above the flood elevations and to their existing height/density if needed. So, Question One does not help condominium owners. Mr. Byron statement that density is not affected is misleading. While the living density of any given parcel will not change, I have to ask what will developers place on the first floor if they are not allowed to utilize this space for habitable units. Parking might be a logical choice but so would retail space. Developers will choose whichever is most profitable (that’s how business works). If additional retail space is the choice this could greatly increase the overall daily population in our city as tourists and out of towners patronize these new retail spaces. In turn this will increase traffic, congestion, and stress to the Indian River Lagoon, drastically altering the small-town atmosphere most of us love so much. So, it’s pretty obvious that Question One is being promoted to benefit developers, not the residents which will end up with more and taller buildings and footing the bill for this additional development. Cocoa Beach has done a great job maintaining its small beach town atmosphere BECAUSE of the existing Charter Height limitations, they should not be changed or altered in any way. The Political Action Committee “protect and preserve Cocoa Beach” is being funded by the developers which should also give us an inkling of what the ultimate goal is – ie more development, causing more congestion, traffic, and stress on the Indian River Lagoon. Ask yourselves, with all our existing problems with aging infrastructure, traffic, congestion, and Lagoon issues do we really need more development with taller buildings in our town. Let’s fix our current issues first and then re-visit this thing, now is not the time for this amendment. I did agree with one statement Mr. Byron voiced – “Protect our City” – So I say to “Vote NO on Cocoa Beach Question One” – to maintain our existing height limitations and preserve and protect our small beach town atmosphere. Vote NO on Cocoa Beach Question One! WOW! You’ve really done your homework. Thanks for this detailed rebuttal to the false narrative that’s being jammed down our throats. I’m a NO. Hey, is that Pinocchio in the picture? Byron and his ilk have tried deceptive measure for years to undermine the height limit we voted for. Looks like we’ll be inundated with spin and propaganda until the election. It’s like tv commercials trying to convince us we want something that we really have no need for. When there’s a Political Action Committee (PAC) involved, I almost always go the other way. I agree with the post & the previous comment. The name is deceptive in that we shouldn’t need to pass this amendment to “preserve and protect” what should already be protected. How are so many other coastal cities able to exist with even lower height than Cocoa Beach? We have a spending problem here. In light of the Hurricane Michael news coverage, damaging impact increases on the higher levels of the building. And we’re going to put multiple a/c units up there? How much do those things weigh? What happens if they go airborne? 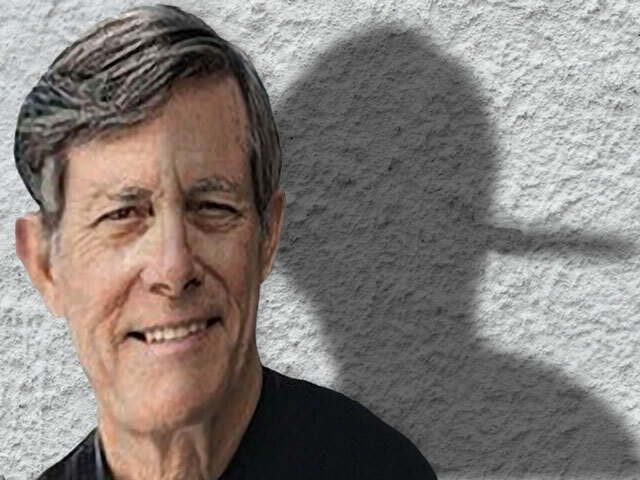 Yes, it is a version of Pinocchio in the picture, but he can’t make the transition to telling the truth and becoming a real, live boy, as in Walt Disney’s adaptation. Just like last time this is going to take a grass roots effort to get the real facts out to residents who love Cocoa Beach. What residents can do is spread the word to Everyone you know so they aren’t deceived by all the misleading info being fed to us. Spread the word to vote No on CB question one. Subject:	“Cocoa Beach: If Question One is So Great, Why Lie about it?” and responses. I can’t help but think: are these WORDS really lies or sins of omission. a ballot charter amendment recommendation to the city commissioners. The CRC proposal was rejected by the Commission. which was also rejected by the Commission. At the next meeting Commissioner Miller presented a similar idea but added an additional 10’ of uninhabited space to a building’s top and the City Commission approved their ballot initiative language, i.e., now Amendment No. 1 to be voted on in November. This current amendment on the ballot will allow a structure’s height of up to 45’ of habitable space measured from the highest FEMA flood elevation on the parcel (which I believe is as high as 12’ – 14’ in our city) in lieu of the crown of the road and will also allow another 10’ of uninhabitable space on top of the structure. They say the devil is in the details and I’m a little concerned that the term “uninhabited” has replaced the term “appurtenances”. The term “appurtenances” is defined in our city codes but the term “uninhabited” does not appear to be defined in our city codes anywhere. I have to wonder why the switch from a previously defined word terminology to an undefined word terminology which is not in our city codes. Could it be preparation for the next move, let’s change uninhabited to inhabited since it doesn’t affect the overall height of the building, hmmm!!! On October 4th, the City Commissioners agreed that the “education brochure” explaining the proposed amendment that they had released to the public was misleading and needed correction. Staff was authorized to make the corrections and release the corrected “facts” to the public. Another troubling point is that I have heard nothing about the dollar amount of infrastructure/ documentation impacts if either of these amendments are approved. Changes cost money, infrastructure costs money, why hasn’t the commission evaluated these impacts prior to placing their proposals on the ballot. On the second, Cocoa Beach Amendment No. 2, I can’t help but wonder if the current charter is functional and working fine as the City Commission has stated, why bother changing it. So I’m voting no on Amendment No. 2 too. While I have those senior moments I can still add 10’ plus 45’ plus Flood elevations (as high as 13’) and SEE the answer is 68’! I say Vote NO on both Cocoa Beach City Amendments that touch our City Charter.